In December the French passenger car market only achieved around 165,000 registrations which equated to a double-digit loss of 14.5%. 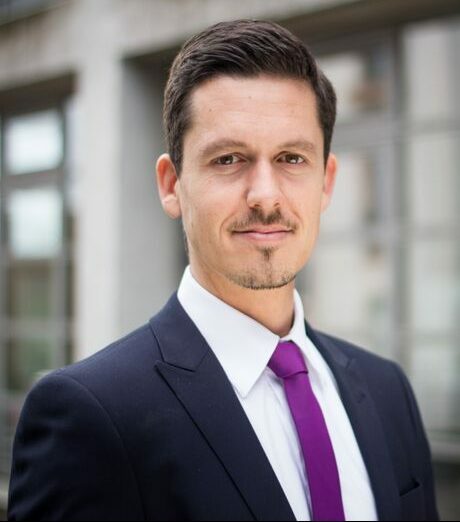 With “only” – 9.6% the drop for True Fleets was less dramatic than for the Private channel (− 15.6%) or for the registrations of Dealerships and Manufacturers (− 26.4%). Only the volume on Short Term Rental companies was higher than seen in December 2017 with + 12.4%. Overall the last three months have been pretty bumpy; especially for True Fleets. While the first three quarters of 2018 all showed growing volumes, the fourth one was clearly in the red with – 6.5%. Thanks to the strong period from January-August (September was already down) True Fleets retained a growth of 2.5% year-to-date, in contrast to markets like Germany, Italy or the United Kingdom. Peugeot and Renault switched positions compared to December last year followed by Citroën who remained in third place and was the first of only three brands within the top ten with a volume increase in the current month (+ 17.1%). This was mainly supported by the models C3 (number one by absolute volume growth in True Fleets in December) and the C3 Aircross which was third in the Small SUV segment behind Renault Captur and Peugeot 2008. The German OEMs Volkswagen, Mercedes and BMW all kept their positions, but Toyota jumped from 11th into 7th place with a remarkable + 47.9%. Audi, Ford and Volvo completed the top ten but outside of this group there were several brands which deserve a mention as well. Thanks to an impressive + 51.5% Skoda ranked 12th (December 2017: 15th), and DS even grew by 53.7%. The main pillars for that were the models Octavia, Karoq and DS7 Crossback respectively. 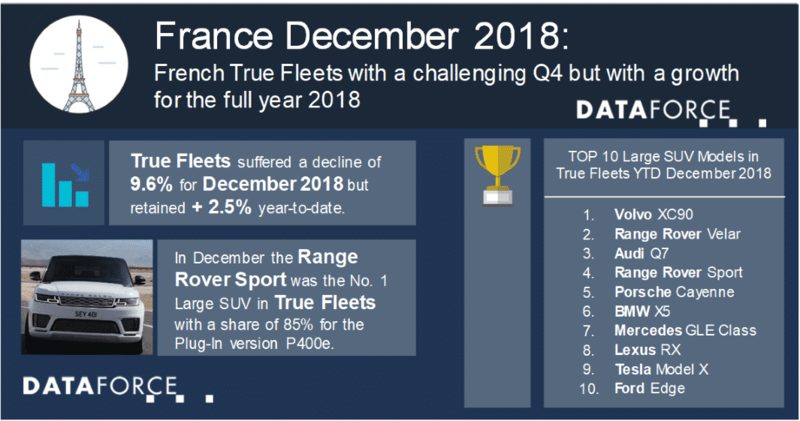 The performance of the Hyundai Kona helped the Korean manufacturer to score the highest percentage growth within the top 30 brands and to achieve its highest market share in the French True Fleet Market since December 2015. Interesting to see that the full electric version already accounted for more than 40 percent of Kona’s fleet registrations. Despite the drop of 9.6% for True Fleets the registrations of company cars equipped with a Petrol engine were up by 33.4%. Consequently, the share of Petrol rose to 29.4%. That might not appear particularly impressive on the first look. But for the French market – which up until recently was a high share Diesel market – this is in fact a new record for Petrol. EVs and Hybrids also showed a strong increase with + 34.4% and + 22.8% respectively while the Plug-In Hybrids (PHEV) had to face a drop of 15.1%. However, there were some PHEVs with very positive results, especially large SUV models like the Land Rover Range Rover Sport or Volvo’s XC90. Now this will certainly have been influenced by the high malus that the French vehicle taxation allocates to the typical CO2 range of a large SUV, so opting for a PHEV appears the logical choice. So much so that the group of Large SUVs achieved the highest PHEV volume from all vehicle segments in December! Publication only with indication of source (Dataforce).